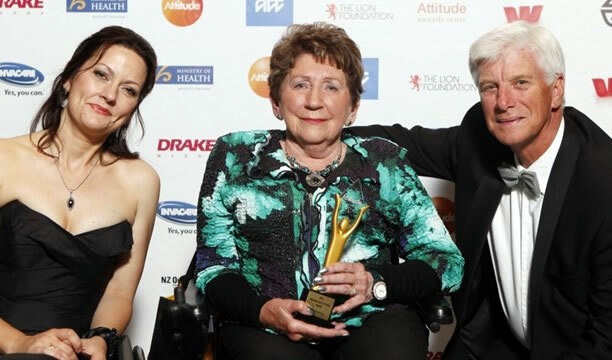 Alexia Pickering’s induction into the Attitude Awards Hall of Fame recognised her lifelong dedication to championing accessibility for all New Zealanders. Pickering was born Alexia Pilcher in Petone on 20 May 1930 with spina bifida, a complex neural tube defect that occurs during a foetus’s early development. The vertebrae (spine) does not completely close around the spinal cord and results in varying degrees of permanent damage and paralysis. At ten months old Alexia was operated on by influential orthopaedic surgeon Alexander Gillies, who went on to found CCS Disability Action (formally Crippled Children Society). Growing up, she used to tell people she was in a wheelchair because she had polio, or had fallen off a roof, because few people knew what spina bifida was. Alexia excelled at primary and high school after spending the first seven years of her life in and out of hospital. She had a talent for music and sang on National Radio during her early twenties, around the time she met her future husband, Neville Pickering. Following their marriage it took the couple four years to convince authorities to allow them to adopt a child. They went on to adopt three children and Pickering later gave birth to a fourth. Pickering became vocal about disability access issues while her husband was a Member of Parliament (from 1957 to 1960) and then Mayor of Christchurch (from 1971 to 1974). She used her personal experience of barriers to her independence – such as the lack of wheelchair access to many public buildings – to lobby, promote and petition on behalf of people with disabilities. She became director of the Disability Resource Centre in 1988, was a founding member of the Disabled Persons Assembly, and served on many government inquiries and commissions. While travelling in London she came across a guide for people with limited mobility and decided to create her own for New Zealand. After two years of research throughout the country she published the accommodation guide, Accessible New Zealand. In the 1996 New Year’s Honours Pickering was appointed a Companion of the Queen’s Service Order and in 2005 a Companion of the New Zealand Order of Merit. Right up until her death in 2017 she continued to work as an expert in the field of disability access and was highly regarded for her energy, leadership and commitment. We have 10 biographies, 3 articles, related to Alexia Pickering inducted into the Attitude Awards Hall of Fame.